Easter is probably my favorite holiday! I love the colors, the candy, eggs and everything else that goes along with Easter. Easter is also the perfect time of year to whip up some easy to make dessert recipes. 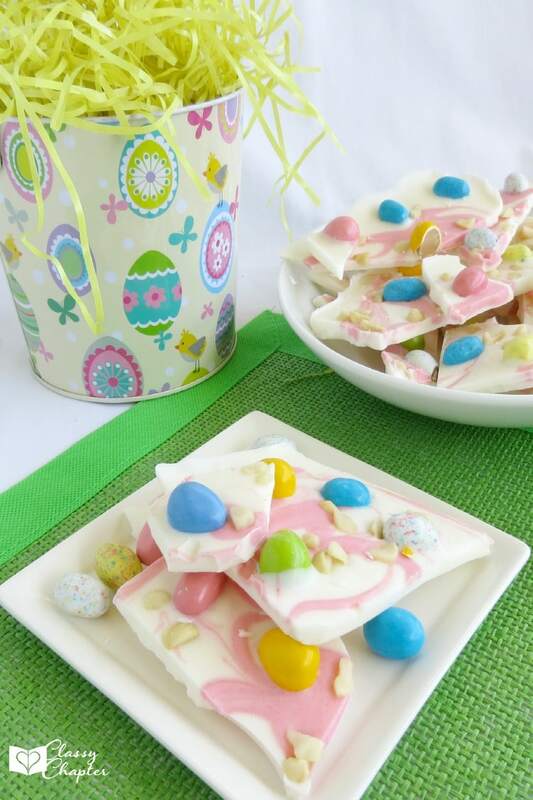 This Easter Bark recipe is super easy and fun to make! Not only is this recipe so easy to make but it looks so pretty! Your kids, family members and guests will love this easy dessert recipe. *If you don’t enjoy macadamia nuts you can easily omit these or swap them out for something else you’ll enjoy. — Line a 13″x9″ dish or pan with wax paper overlapping the sides and set aside. — Break apart vanilla candy coating and place in microwave-safe bowl. — Cook in microwave for 30 seconds, stir and repeat until melted. — Reserve 1/8 cup and pour the rest onto the lined dish, spread evenly. 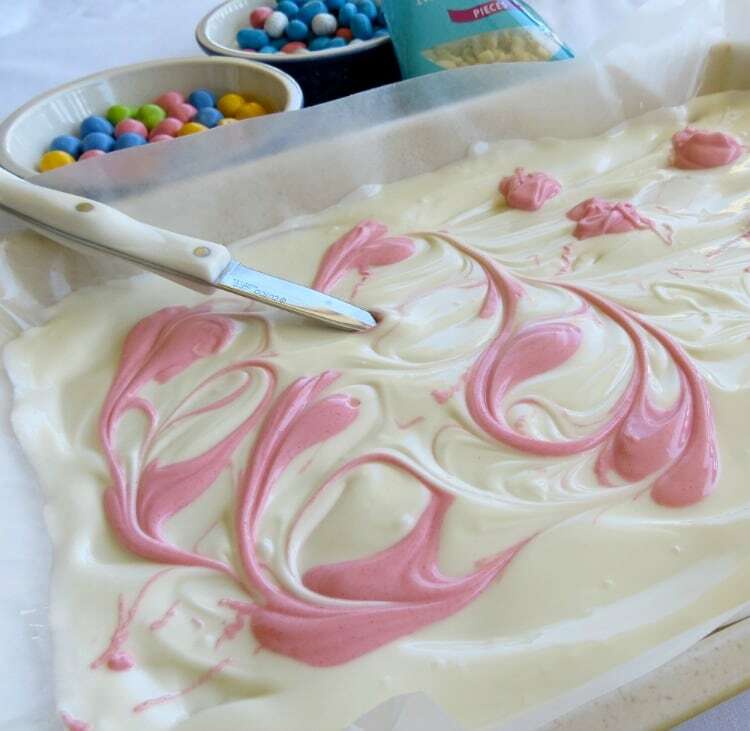 — Add two drops of food coloring to the reserved vanilla candy coating and mix. — With the tip of a knife, swirl the two together. — Sprinkle the nuts over the chocolate, followed by the candy. — Lightly press everything down into the vanilla candy coating. — Place in the refrigerator until firm (about 45 minutes). — Lift out of the pan using the wax paper as handles and cut into pieces to serve or give as gifts. Remember your cuts don’t have to be perfect. 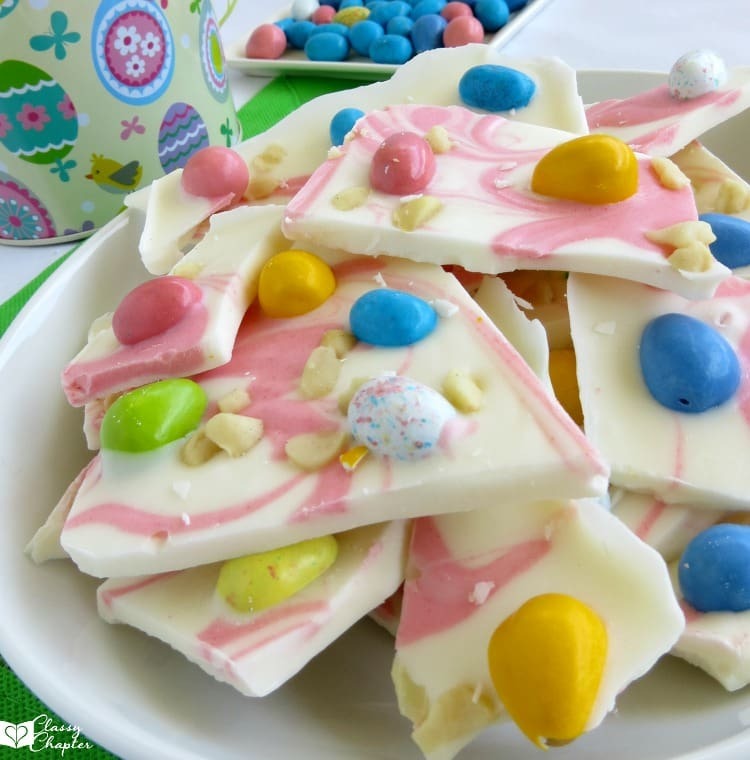 Easter Bark is meant to look a little messy and unperfect. Have fun with this! 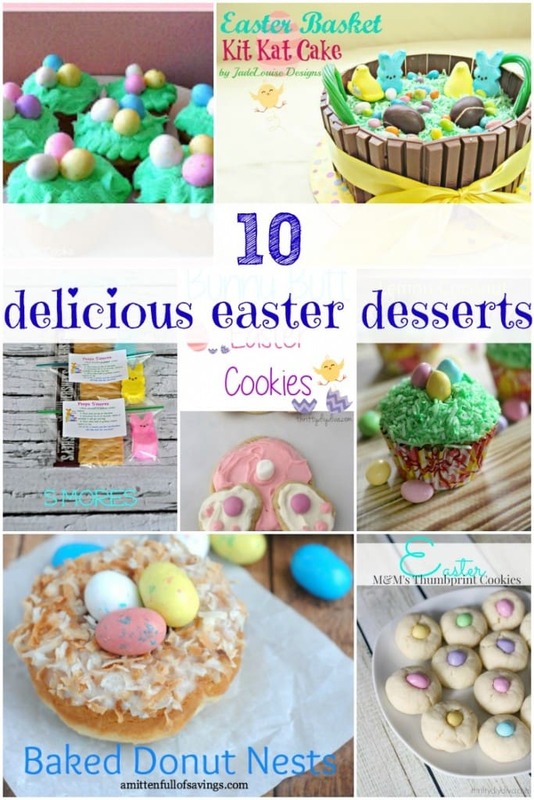 If you are looking for more Easter recipes make sure to check out my 10 Delicious Easter Desserts post. Do you have a favorite Easter recipe? If so tells us about it in the comments! That looks so good!! I bet my kids would enjoy making it too.